You can’t play without buildings. They are few types – mines for resources and solar panels that provide energy for them - both form your resource production sector, industrial buildings like Shipyard, Science center, Robot factory etc. that form your account development sector and Storages for the different resources you have. The buildings are separate for each planet, so you must build the on every planet independently according the local needs. 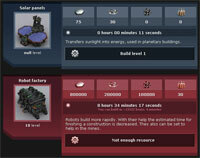 To build a building, you must have the required resources and energy for that level. The mines take a constant amount of energy – i.e. if you have a 1000 free energy and the mine requires 200, after the level is done you will have 800 free. If your energy becomes with negative value, your mine will continue to work, but you can’t build another building until you obtain positive value again. If the requirement for another building says -20, that mean that you must have 20 free energy available to build it, but after it is done, it will not take these 20 energy. 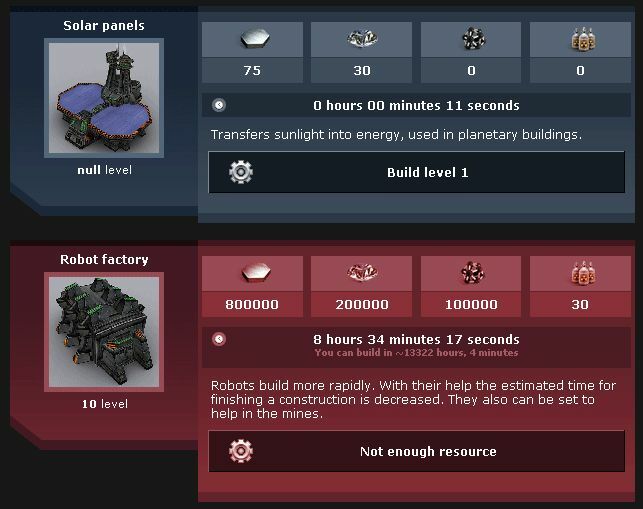 If you see a building in red, this means that there is some obstruction to build it – not enough resources, energy or some additional requirement, that you can check in the “Technics” menu. Each building level occupies one free field on your planet. 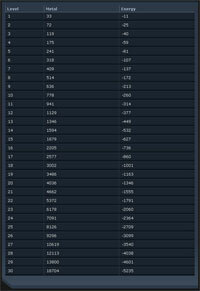 On “Overview” menu you can see how many unoccupied fields you have available. If you want to see the information about a building, just click on its picture. Below the information text, you will see a button “Demolish the current level”. A click there demolishes the highest level of the building. After that you will receive information about the obtained resources – a random value between 40% and 60% of the cost of the demolished level. If a building has reached its maximal level, it disappears from “Buildings” menu. 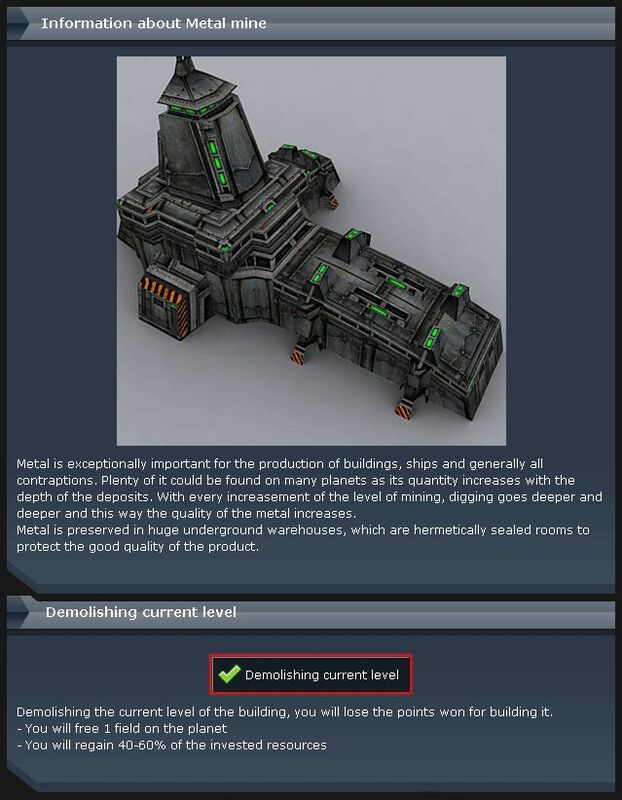 To demolish a level, go to Technics menu, find the building and proceed like the aforementioned way. 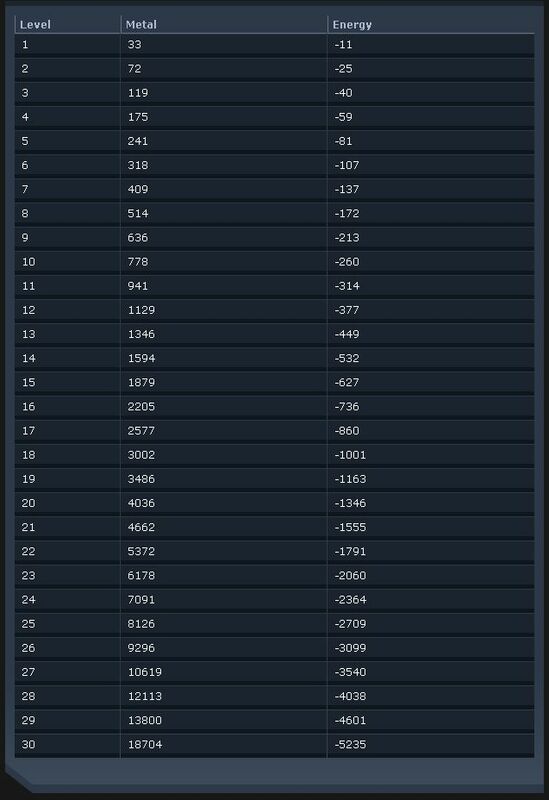 How much a mine produces per level? 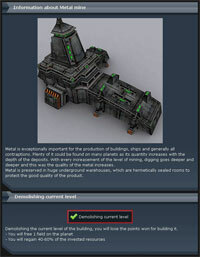 Below the information text and the building demolition button you will see a table with the basic production of each level and the energy consumption.